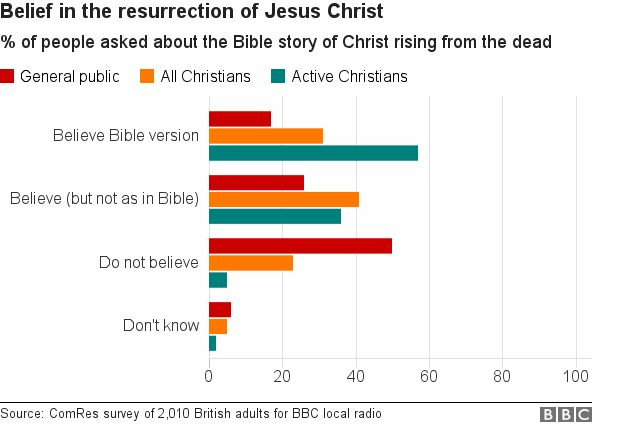 A quarter of people who describe themselves as Christians in Great Britain do not believe in the resurrection of Jesus, a survey commissioned by the BBC suggests. However, almost one in 10 people of no religion say they do believe the Easter story, but it has “some content that should not be taken literally”. A fifth of non-religious people believe in life after death, the poll suggests. The Church of England said it showed many people held religious beliefs. ComRes surveyed 2,010 British adults by telephone, between 2 and 12 February 2017. The research was commissioned by BBC local radio for Palm Sunday. Reverend Dr Lorraine Cavanagh is the acting general secretary for Modern Church, which promotes liberal Christian theology. She said: “I think [people answering the survey] are being asked to believe in the way they might have been asked to believe when they were at Sunday school. “You’re talking about adults here. And an adult faith requires that it be constantly questioned, constantly re-interpreted, which incidentally is very much what Modern Church is actually about. “Science, but also intellectual and philosophical thought has progressed. It has a trickle-down effect on just about everybody’s lives.